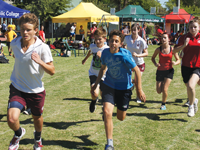 Our annual Athletics Carnival has been shifted to tomorrow (Tuesday 1st April) as poor weather is predicted for Wednesday this week. We would also like to remind parents and students that this is a compulsory school day and attendance will be recorded. We look forward to an enjoyable day tomorrow, which will be heightened by whole-school student attendance. Make sure you support your house group with your house colours! Classes will resume as normal on Wednesday.